﻿This kepi hat is based on the original Civil War Era design and features the distinctive sloping crown and working chin strap. Make it in a solid blue or gray or change up the colors for specific army branches or regiments. Color suggestions are included with the instructions. The PDF sewing pattern is sized to fit American Girl® and other similarly sized dolls. Recommended Fabrics: Crown in medium weight wool, wool blend, cotton twill, or linen. Not suitable for knits. Crown Lining in light weight cotton, silk, or polyester lining. Not suitable for knits. Brim and Straps in jacket weight leather, faux suede, faux leather, or medium weight canvas. Not suitable for knits. Trim in lightweight cotton, silk, or polyester. Not suitable for knits. -Thread. Heavyweight fusible interfacing or Buckram; two gold rivets or rivet buttons; one 1/4-inch wide prong buckle: optional Civil War insignia lapel pin (available at many Civil War historical sites). What You Get: One 15 page sewing pattern that you digitally download as a PDF file so you can start your project immediately! The PDF sewing pattern provides digitally drawn step-by-step illustrated instructions and full size pattern pieces. A PDF reader is required to view and print the files (example: Adobe Reader or Preview for MAC). The download link is received immediately after the transaction is complete. Print copies are NOT available. Very nice much easier than I expected. Perfect addition to my civil war uniform. I have made the civil war costumes in both the blue and the grey. They are fantastic! It not only fits the size of the doll's head, but the slouch is perfect for the Civil War style. Thimbles and Acorns provided excellent fabric suggestions. The hat was made perfect with the little brass insignias. Mine came from the gift shop at Gettysburg. They are on revolving displays with tie tacks and keychains. The buckles can be found at Joann's and Hancock Fabrics (be sure to buy a couple during the 50% off sales!). The pattern was easy to sew. 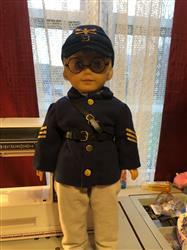 I haven't made a Civil War uniform for my boy, but Thimbles offers one. My husband is a civil war buff and he loved this cap. The bias binding around the front was a bit difficult (my problem, not theirs) but overall the pattern fit together well and instructions well written. Will be making again!